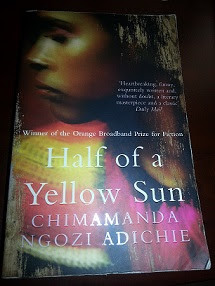 I deem it fitting that I start my first book review series with a post of the critically acclaimed and winner of the Orange Broadband Prize for Fiction Chimamanda Ngozi Adichie's Half of a Yellow Sun. The reason I chose to review this book first even though I have read Purple Hibiscus and currently reading her latest offering Americanah; I wanted to read about the book that put her on the map and earned her the many respects around the world. I must say that the book has delivered to its promise. The clever and intelligent writing made my morning and evening train trips to and fro work very pleasant and something to look forward to everyday. At times, even the 40 minute rides felt like 10 minutes. The book takes us back to a time in Africa, rather Nigeria in particular where the continent was plagued by civil war and colonialism. The scene is set at a time when the Igbo, Yoruba and Hausa people were fighting for power. Even during this time, life still had to go on. The book focuses on a young woman by the name of Olanna, who was from a well off family. However this lady chose love over comfort and royalty, like they say "love can make you do strange things that you would not normally do". She was in love with a university professor, and that is where she found comfort and her heart felt at peace . However, that did not mean that there were no challenges in their relationship. She has faced trials and tribulations, especially from her mother-in-law who was not receptive of her. She felt she was not good enough for her son because she was a city girl whom in her mind, could never take care of her son like a village woman would. Not only that, even when her man(Odenigbo) threw himself at alcohol just so he could forget for a moment just what was going on around him, even that did not deter her to give up on their love. If I were to list all the things that have gone wrong in her relationship with Odenigbo, I would spoil it for you and make you not want to read it. In a nutshell, the book is about the end of social and colonial oppression in the 60s, young love, what class and wealth means to different people.